As the month dedicated to giving thanks culminates this week, people are also in the process of preparing for Christmas. I have spent the past year sorting through a lot of things in my life, both material and internal, dusting off treasures from the past and looking forward to the future. 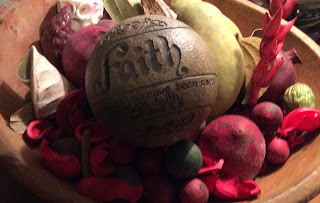 In the process I found my faith, sitting alone in the midst of the fragrance of potpourri. 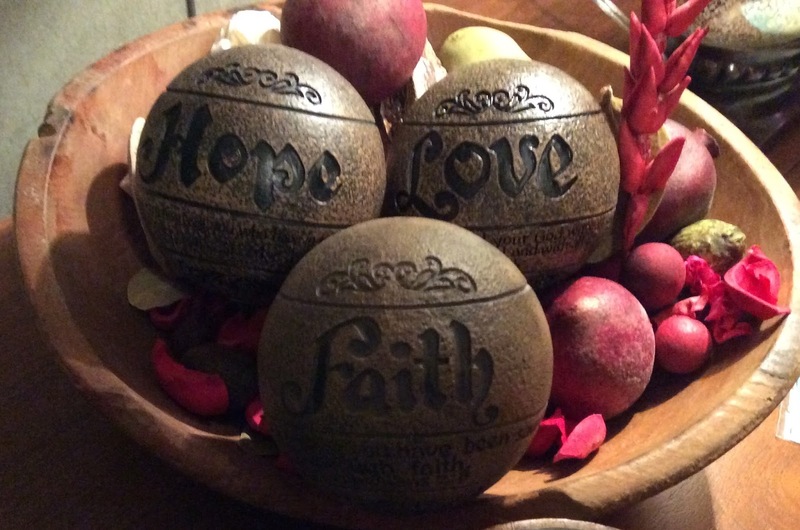 I am reminded of how our faith is often with us, but if we are not careful it can get lost. Love & Hope, which at first I thought may have been lost, needed to be brought back into my life. They had been broken long ago, but I knew it was time for them to once again be a part of my Faith. When things like Love & Hope rejoin our lives there is a warmth and a newness to it all, but what I noticed when I placed them next to my Faith, was that my Faith had grown dim, worn, and weary from all that life had put it through. Don’t we all have times such as this, where we don't necessarily lose our faith, but where it grows dim from weariness? I needed to revive my Faith, polish it if you will, so that it could embrace and welcome back in Love & Hope. In the process I was reminded of the mustard seed. God tells us that all we need is the faith of ONE mustard seed. 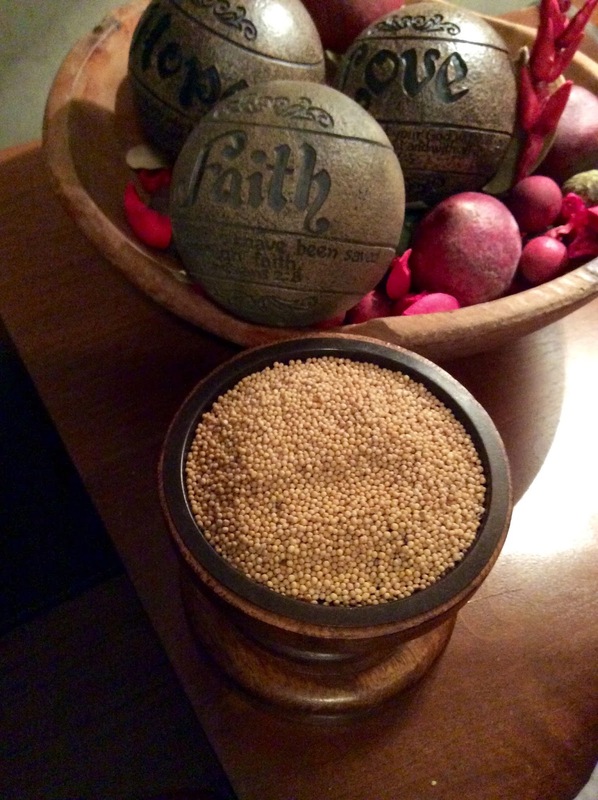 When you look at all of the tiny mustard seeds in the little bowl, what an incredible thing it is to realize that all He asks is that our Faith be the size of just ONE. Sometimes, before we can start to decorate the outside of our lives, whether that be by putting up Christmas lights, building a writing cottage, or having an extreme physical makeover, we first have to dust off and clear out the things in our lives that have led to our Faith becoming dim. Maybe that entails letting go of hurtful words that have held us back, or betrayal, or maybe it is just a matter of learning to be comfortable in our own skin. Learning that our Faith was with us all along and sometimes in the battles of life it will get dim, not because we lost our Faith, but because in every battle that we must fight dust and dirt will fly so that we can win the fight. A soldier’s uniform gets dirty as he or she fights to save the freedom that we hold dear. Our Faith can also get covered in dirt, not because it has grown weary after all, but because we have been in the trenches fighting the good fight. So as we give thanks this week and start to write out our Christmas lists, I think the most precious gift I can give to myself and those around me, is to finish what the Lord has started in my life, polish up my Faith, surround it with Hope & Love and see what beauty results on the outside in this coming new year. Well this is it, THE big day – THE BIG 50!! The thing is though, age is just a number to me. Yes, it is a BIG day, but not because of the date, but because of the INCREDIBLE adventure that begins today in my life. It seemed only fitting as I celebrate the day of my birth to look at the AMAZING women that have helped to make me the woman that I am today. My life has been an adventure to say the least, but as Helen Keller said, “Life is either a daring adventure or nothing at all.” I can honestly say that I live this every single day and I wouldn’t have it any other way. My return to school was instilled into both my brother and I from a very young age. Our Meme always taught us that education was something no one could take away from you. I have kind of taken that to the extreme, but I get that is what us computer geeks do. Meme’s compassion and love for us and her friends definitely passed down to me. I am so very, very blessed to have the INCREDIBLE people that I do in my life. Their friendship is a priceless gift that cannot be bought in any store. My grandmother was such a beautiful woman, both when she was young and when she was older. She was never afraid of growing old and I think that trait she also passed down to me as well. And then there is JANE. For those of you who knew her, you know exactly what that last sentence meant. My mom, Jane, was a spirit that the world could not contain. Her spirit of adventure lives within me. God needed her way too soon, but it is through my writings that she continues to live on. This picture of her and my Aunt Mary Lee so reminds me of some of the adventures that I now have with my friends. Thank goodness those two didn’t have access to smart phones back in the day!! I spend countless hours on the phones with friends, who I have nick named the Posse, because they have grown very protective of me over the past several years. As we ponder not only life’s questions, we also share what God is doing daily in all of our lives. To watch Him move in the lives of such an adventurous bunch makes our spirits dance even when life throws one of us a curve ball. We literally laugh and cry from the time we wake up until the time we go to sleep at night. I know how blessed I am to be surrounded by such an incredible group of people. So now I will load my friends up in a car and off we will go to celebrate my day – and perhaps find a few new things to add to my books!! As I close, I leave you with this – CELEBRATE, celebrate all that life brings your way, both the good and the bad. The tough times cause us to grow in our faith and as a person. The good times let us treasure the people, places, and progress that we make in our lives. The combination…well that is what allows us to give our spirit wings to soar and become all that God intended for us to be all along…sometimes we just get sidetracked and go down roads that He never meant for us to begin with. He always steers us back in the right direction…and for now, you will just have to trust this new 50 year old woman with that!! Wow, it has been over 7 months since I have written on my site, but now it is time to share my incredible new adventures with the world once again. It has been such an amazing time in my life with doors opening that I thought had long since been closed. As storms move through the area today I am reminded of how the storms of life, no matter how severe, always pass and the sun does always shine again. What we often do not realize while we are in the storms is that when God has things fall apart in our lives, it is to make room for what He truly meant to take place in our lives all along. When we experience heartbreak it allows us to know that we do have a heart and it allows us to treasure the precious beating hearts that God does send into our lives, be they fellow students, colleagues, friends, a soulmate, incredible children & son-in-law, or a precious grandson. For years I lived with regret of not finishing my Ph.D., but God opened that once closed door and I am now about to complete my first semester. It is THE most challenging, rewarding, and exciting adventure to date. I am beyond blessed and thankful for this gift & second chance that I have been given. For years I have wanted a writing cottage and creative space of my own in my little corner of the world and now I will celebrate my 50th birthday with that dream also becoming a reality. I am so very thankful for the incredible circle of family & friends helping me make this dream my new reality. For years I have wanted a home where I could celebrate life with family & friends, where Curiosity Cottage wasn’t just a name on a website or business card, but the very essence of my existence. That has now come to pass as well. I am so very thankful for the cheerleaders in my life who have stood behind me as I have brought my vision to life. For years I dreamed of being a Meme and the New Year will bring with it my precious baby Eli. I am so very thankful for this incredible gift that God is bringing into our lives and it makes me even more thankful that I had such an amazing Meme as a role model. Sometimes we search for answers we know we will never get, but when the storm passes we realize that we never really needed answers at all. When the storm passes we are left simply wanting to send a thank you note out into the world – thank you for teaching me to embrace life again & dance to the sound of the rain; thank you for not being who I thought you were; thank you for the storm; and thank you for showing me what love was not so that God could show me what love truly is. The reality is that sometimes when someone sets out to break our heart they inadvertently end up helping us discover where our heart was meant to be all along. I celebrate this season of thanksgiving appreciating every little tiny treasure that God has given me and seeking to share all of His goodness & blessings with this hurting world. As I bring my dreams to fruition I want to now write about this process on my site so that you can also hold on to hopes & dreams that maybe you thought would never come to fruition. God will give you the desires of your heart, no matter how long ago He whispered them to you. Never doubt that and if need be take hold of your mustard seed to remind you of His promises daily. Always remember, sometimes the storms must come so that He can make room for your sunshine!